The job search site Indeed released a report on Tuesday with a startling finding: The US is losing $US160 billion annually due to unfilled jobs. It’s not that people aren’t trying to find work. Rather, there aren’t enough people with the right backgrounds to fill highly specialised roles, like data scientists and software engineers, that are crucial to businesses. Indeed SVP of Marketing Paul D’Arcy says it’s evidence of a split in the American economy. As the number of open positions grows, it’s only getting worse. “It gets harder to fill those spots, there’s more competition for that talent, and those positions inevitably end up staying open a lot longer,” he says. That logjam is especially acute in the 16 industries featured in the below chart. 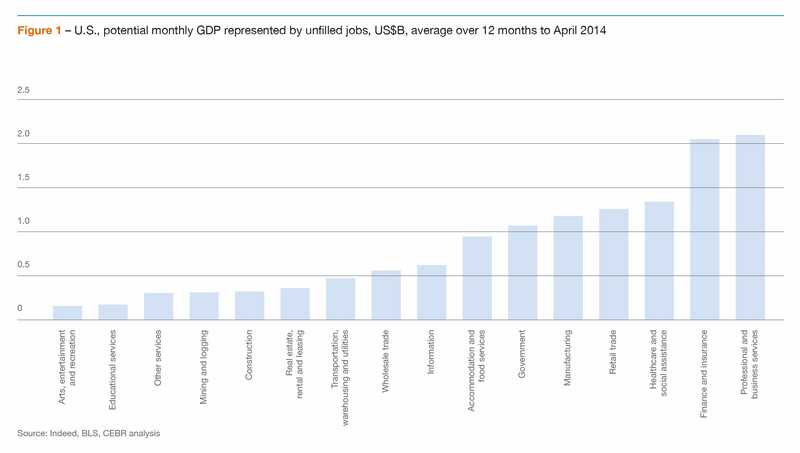 IndeedThe loss of GDP per industry per year. The numbers here measure what economists call “gross value added” and are made up of two parts: the loss of wages to the individual that might have filled the job, and the loss of income a firm faces when a revenue-producing position sits unfilled. That’s why fields like finance and professional services face such gigantic losses. A highly skilled finance professional not only makes a ton of money — as compensation packages at Goldman Sachs, JP Morgan, and Morgan Stanley illustrate — but they bring in loads of revenue for their firms. Those high-paying industries are able to spend the most on hiring people with in-demand skillsets like software development, data science, and other technical skills. As a result, it gets even harder for lower-paying sectors to fill vacant jobs, since candidates get poached by higher-paying companies. That’s most evident in the least lucrative sectors: 38% of education jobs stayed open for at least three months, 39% of manufacturing jobs, and a whopping 43% in accommodation and food services. These sectors have highly skilled roles — education increasingly relies on tech talent to manage networks or distribute massive online courses — but they simply aren’t as well-paid as in other industries. “You’re competing for that talent with financial firms and large companies that need those same talents but have a lot more resources to hire and pay those people,” D’Arcy says.